KANSAS CITY, Mo. 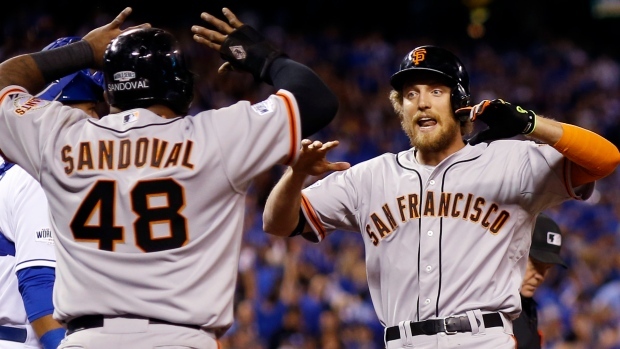 - Hunter Pence most definitely found the right place. A day after saying he hadn't been sure until this year that the Royals played in Missouri rather than Kansas, Pence jolted Kauffman Stadium with a two-run, first-inning homer that quieted the crowd and sparked the San Francisco Giants to a 7-1 win in Tuesday night's World Series opener. "It was really loud in my head," Pence said. "Sometimes, my mind, when I'm playing the game or our team is doing something good, it's like an emptiness. I don't know what's going on around me." Pence had been 0 for 11 against James Shields before the homer. The right fielder who wears his socks extraordinarily high doubled and scored for a 4-0 lead in the fourth and also walked twice as the Giants won their seventh straight Series game dating to 2010. "You've got to work down, almost bouncing pitches at times," Kansas City manager Ned Yost said. "But his strike zone is so big, it's difficult." Pence started a meme on Aug. 1 when he tweeted a photo of himself in a New York coffee shop with the message, "These pretzels are making me thirsty," a reference to a 1991 episode of the television sitcom "Seinfeld." Fans started showing up at ballparks referencing Pence's quirks with nonsensical signs. "One of my favourites in Kansas City was, 'Hunter Pence Thinks He's in Kansas,'" Pence explained on the eve of the opener. "Once I read the sign, I said, 'I guess I'm not in Kansas, so I have to be in Missouri.' So I didn't know." The 31-year-old right fielder, acquired by the Giants from Philadelphia at the 2012 trade deadline, entertained at Monday's media day, looking a bit like a mid-1980s Bruce Springsteen with a bandanna around his hair. He's been known to wear a "LINCECOM KNOWS" sign in honour of teammate Tim Lincecum, who dresses a couple of spots away in San Francisco's home clubhouse. A three-time All-Star, Pence is among the key emotional components in a clubhouse that could become the first NL team to win three championships in a five-year span since the 1942-46 St. Louis Cardinals. His leaping catch — tongue wagging, too — against the right-field wall of Jayson Werth's sixth-inning drive helped the Giants in their clinching Game 4 win over Washington in the NL Division Series. He gathers his teammates in the clubhouse after wins for profanity-filled speeches or to offer congratulations for certain accomplishments, team and individual. Sometimes, manager Bruce Bochy doesn't need to say a word in team meetings, acknowledging Pence had the subject covered quite well. "His energy, his enthusiasm, his passion for the game — he's tireless," Bochy said. "Not a lot of guys can get themselves up every day the way he does. He's a tireless worker, and I've said this: He's my lowest maintenance player I've ever had. I just put his name in the lineup and leave him alone." Pence calls playing in San Francisco at always sold-out AT&T Park "a magical atmosphere." "It's just a group that I felt like I fit in," he said. "There are a lot of accepting people of different personalities." Bumgarner said Pence holds most of the team meetings, not Bochy. He praised him profusely, saying "it's been an honour and a blessing to have him as a teammate." Sitting next to him, Pence leaned over to give a bromance hug and patted the pitcher on the head. "I paid him to say that," he said before quickly adding: "No, I'm just kidding." That intense focus and always-on personality is part of Pence. "It's kind of a blessing and a curse," he said. "At home, I get people really angry with me, but on the field it works out good."